Heuchera’s are good ever green perennials for borders and containers, ground cover and even hanging baskets. All Heucheras enjoy partial shade, some will enjoy the full sun as well, while other love full shade. Please see the symbols to help. Easy plants to grow they benefit a light trim in Spring and again if you want to in August, this gives them time to grow enough leaves to give you a good show again for Autumn and Winter. Most Heuchera grow well in coastal positions. Most people find they are rabbit and deer proof. Although I dont guarantee that as there are some rabbits that will just eat anything!!! 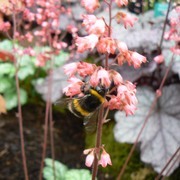 Heucheras are a favourite with the bees. This is great as we need bees in the garden. Bees are the gardeners best friend. If you have a vegetable patch, fruit trees and bushes or even perennials you will really want to encourage bees into the garden. Some heucheras will set seed but not all ask when buying. However most do not come true from seed, but you can get some exciting results if you try. Bees are premier pollinators for your plants, fruit and vegetables. Heucheras only have very small flowers but bees will come from far and wide if you have a few in your garden. All our plants are grown with vine weevil control used on the nursery and in the compost. We use Mett 52 which is like a fungus that grows when the weather warms up a little. It will keep growing as the temperate rises. You will not see any mushrooms so don’t worry. When a vine weevil touches the fungus, it will die quite quickly. Mett52 has no chemicals it is completely natural. We also use the nematodes mentioned below, once again all completely natural. We only sell plants grown on our nursery all our plants are vine weevil free when they leave our nursery. Below is our own advise followed by in depth information from the RHS advisory service. Vine weevil are a pest any gardener would prefer never to see in their garden. Taxus,Tsuga, Wisteria and plenty of other plants that you love! Sorry! Heucheras are different than alot of other plants when affected by Vine weevil so don’t despair read on….. If your beloved Heuchera comes under attack and you discover that most or all of the roots have gone. Lift your plant and inspect the roots or lack of them tacking all the compost off. If they fall into pieces don’t worry, take the stumpy pieces that are left that have a basal ‘knobble’ (where the leaves or roots usually come from) and wash in clean water, vigorously. Take a cocktail stick and check the bottom has no little horrors left hidding in there, pick out with cocktail stick if you find one, feel free to vent your anger on them at this point! (Very therapeutic I think) Robins and birds will love them from the bird table (best to kill them first in case they wriggle away!) or give them to your hens if you have them. When all cleaned and de-vine weeviled you can then pop into a fresh pot of compost water lightly. No need to cover. Wait a few weeks and lovely new fresh roots will grow back. Do not over water at this stage as they can go rotten if you do. The bonus is you probably had one plant before now you will have a few to give to your friends or put in other places around your garden. It is one of the most common and devastating garden pests, if not kept under control. The adult weevils eat plant leaves during Spring and Summer, but it is the grubs that cause the most damage over autumn and winter when they feed on plant roots, causing wilting, and often plant death. Adult weevils cause irregular-shaped notches in leaf margins during the Summer. The plump white legless grubs have light brown heads and are up to 10mm (about 3/8in) long. They are likely to be found among the roots. Plants wilt and die during Autumn to Spring as a result of grubs devouring the roots. Sometimes you might see your plant top blow away in a gust of wind! 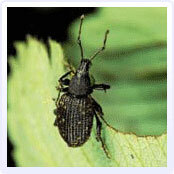 On mild Spring or Summer evenings inspect plants and walls by torchlight and pick off the adult weevils. Shake shrubs over an upturned umbrella to dislodge and collect more. In greenhouses, look under pots or on the underside of staging benches where the beetles hide during the day. Trap adults with sticky barriers, such as Agralan Insect Barrier Glue, placed around pots or on greenhouse staging. A biological control of the larvae is available as a microscopic pathogenic nematode (Steinernema kraussei) available from suppliers of biological controls. Apply in August or early September when the soil temperature is warm enough for the nematode to be effective (5-20ºC/41-68ºF) and before the vine weevil grubs have grown large enough to cause serious damage. Another nematode, Heterorhabditis megidis, is also available but is more temperature-dependant (12-20ºC/ 54-68ºF). Both nematodes can also be applied to garden soil, but give poor results in dry or heavy soils. They work best in open potting composts, such as peat or coir. Nematodes can be used safely on all edible and ornamental plants. Ornamental plants grown in containers can be treated with acetamiprid (Scotts Bug Clear Ultra Vine Weevil Killer) or thiacloprid (Provado Vine Weevil Killer 2) as a liquid drench applied to the compost. These insecticides give protection against the grubs for up to two and four months respectively; treatment in mid- to late Summer will control the young larvae and prevent damage occurring later in the Autumn to Spring period. Neither product can be used to treat edible plants or ornamental plants growing in open soil. Adult vine weevils are responsible for the leaf damage, which can be unsightly but rarely affects the plant’s growth. The adults are 9mm (about 5/16in) long, dull black beetles with a pear-shaped body when viewed from above. Adult weevils may be seen on the foliage at night; during the day they hide in dark places. They are slow-moving insects that cannot fly but they are very persistent crawlers and climbers. Other related species that have recently become established in Britain, such as Otiorhynchus armadillo, O. crataegi and O. salicicola, cause similar damage to foliage. Far more serious is the damage caused by the soil-dwelling larvae, which are plump, white, legless grubs up to10mm (about 3/8in) long with pale brown heads. These eat the roots and also bore into tubers of cyclamen and begonia, and into stem bases of cacti and succulents , devastating many pot plants. They can also kill woody plants by gnawing away the outer tissues of the larger roots and stem bases. Most plant losses occur during September to March, when the grubs are becoming fully grown. All Otiorhynchus sulcatus adults are female and each can lay many hundreds of eggs over a period of several months from April to September. The eggs are brown and less than 1mm (about 1/16in) in diameter, making them very difficult to see in the soil. Larger yellowish-brown spherical objects seen in potting composts are likely to be controlled-release fertiliser pellets added by the nursery that raised the plants. Many thank to the Rhs for providing this useful information. 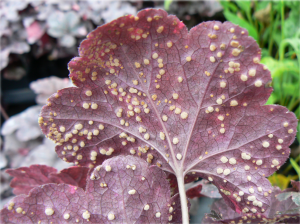 Heucheras can get a rust which is specific to them, in other words it wont spread to other things like roses etc. It only likes Heucheras so that is great news for the rest of the garden, bad news for our Heucheras….. but dont despair…. please read on. One of the first signs is dimples on the surface of the leaf. Turn the leaf over and you may see white raised spots, orange raised spots or brown raised spots. Rust spots cannot be picked off they are as if bonded to the leaf. If you can pick it off without breaking the leaf it is not rust. If the spots are white they they are relatively young, orange raised spots are active and spreading their spores, and brown raised spots have finished spreading their spores, but should still be treated. How to treat your Heucheras. If you find any spots like these act immediatley and cut off all the foliage from the affected plant leaving only the crown. You can remove just affected leaves but it is easy to miss some of the leaves with rust so better to defoliate. DO NOT CUT THE CROWN. this can kill the plant. Do not compost the leaves, either burn or bag up and remove. Then get some Roseclear 3 or something similar containing systhane that is the active ingredient that you need. Follow instructions exactly as it says on the packet and repeat regularly as instructed. Leaves will return very quickly but keep spraying for a while to be sure. Keep an eye on them for a few weeks. It is good practise to look under leaves periodically of any of your plants to identify problems early as if you catch it quickly it is always easier to control. If you have had a problem, a precautionary spray with the roseclear 3 is good practise now and again. The best way to stop a major problem is to be very careful if you do find an affected plant do not go from one plant to another as this just spreads it. This is a good practise within the garden to prevent other diseases on your plants. Rust seems to be particularly prevalent during Summer months when it is warm and damp. You might never see rust on your Heucheras as it does take this particular set of weather conditions to set it off. Heucheras do not have many problems but it is best to know what to look for and know how to treat it. So don’t worry keep enjoying your Heucheras .